"The publication of this microfilm edition will vastly assist readers and scholars everywhere to extend and deepen their knowledge of Edgeworth’s works, through access for the first time to the great bulk of an unusually rich archive of unpublished writings and correspondence." 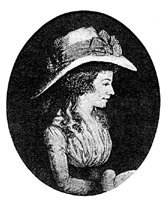 Maria Edgeworth occupies an important place in the history of women’s writing. A pioneer of social realism, her novels represent a significant contribution to the literature of class, race and gender. The British Library - the manuscript of Helen. The National Library of Scotland - Correspondence and poems, including 33 letters from Walter Scott. Birmingham University Library - Correspondence with J M Moilliot, the Birmingham banker, William Whewell, David Wilkie, Kay-Shuttleworth, Madame Romilly and others. The Royal College of Surgeons - the Hunter-Baillie Collection featuring correspondence between Maria Edgeworth and Joanna Baillie.